Food Endeavours of the Blue Apocalypse: Confusion or Fusion Food – Vietnamese Spaghetti Bolognese? Confusion or Fusion Food – Vietnamese Spaghetti Bolognese? David Thompson is one of my favourite chefs and I found his stance on hating fusion food with such a passion quite interesting but as I looked into it I began to understand why he feels this way and where he is coming from. Fusion food is the term for cooking which combines various culinary traditions/techniques and different ingredients from various cuisines to create new and interesting dishes. Fusion food began in the 1960s and 1970s in California where there was a huge influx of Southeast Asian immigrants. 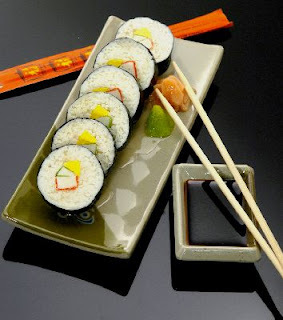 A famous example of fusion food is the California sushi roll. It was developed by a Japanese Chef working in California who substituted avocado for tuna for Americans who were squeamish about eating raw fish. Now the California roll is popular not only in California, but also in Japan and other parts of the world. One form of fusion food is regional fusion that combines the cuisine of a region or sub-region into a single eating experience. For example, there are a lot of pan-Asian restaurants around which serve Chinese, Malaysian, Thai, Vietnamese food all under the same menu and sometimes offer dishes inspired by a combination of all these cuisines. This way I guess the restaurant can reach a larger market but the downside of offering all these cuisines is that it may result in less than authentic tastes and dishes can be poorly executed. It can be more about making money and trying to be all things to all people rather than serving people serious food. Fusion food is also highly controversial, many chefs are critical of it, calling it ‘confusion food’. Fusion food can be flawed as it can combine flavours, textures and techniques which often don’t match. Fusion cooking can lack coherence or logic and thus creates ‘confused food’. A lot of badly conceived and poorly executed dishes have appeared under the fusion food banner, earning it a bad reputation. Some chefs are against fusion food because they value authenticity and believe that it diminishes the integrity of the cuisines it tries to mix. People who delve into fusion cooking can be accused of attempting to conceal their lack of skills by engaging in mixed cuisine cooking. To produce good fusion food, it requires some smarts, skills and experience. It is important to understand the cuisines being combined and the properties of the ingredients used. Some thought needs to be put into the dish being cooked because ingredients can’t be just thrown together. The fundamentals of cooking are required in order to pull off something that ‘works’, and is unique and different successfully. Without proper knowledge and experience in the kitchen, it can result in awful creations. No cuisine exists in isolation and throughout history every culture’s cuisine has evolved and adapted itself to the arrival of new ingredients and new styles as explorers roamed the earth bringing back foodstuffs that they discovered on their voyages. Pasta is synonymous with Italian cuisine and it is widely believed that 14th century explorer Marco Polo introduced pasta into Italy from China, although the first known reference to pasta has been traced to Sicily in the Middle Ages. Countries are becoming more culturally diverse and increasing air travel means that people are continually engaging in many different food experiences. Diners' tastes and expectations change, and fusion food seems like a natural consequence. When I think about fusion food and look at what is considered Modern Australian food, it becomes apparent that Australian food is defined by fusion. 2) multicultural influences from immigration. Australia’s tropical climate produces a wide range of fresh, seasonal produce – plenty of fruits, vegetables and herbs. With acres of land, agriculture is an important industry and quality meat is produced. Lamb is a favourite for many Australian families. Most of the population resides along the coast, and fresh seafood is in abundance and very popular. Aussies are famous for saying “let’s put another shrimp on the barbie, mate!” The diversity of produce available in Australia means that there are a lot of ingredients to choose from for cooking. Australia is a young country and culinary traditions have developed overtime from immigrants settling into Australia. The British were the first to settle into Australia and has inspired culinary traditions like eating a roast, meat pies and dishing up ‘meat and three veg’. The Gold Rush of the mid-19th century brought an influx of Chinese immigrants to Australia bringing in many tastes of the orient (you can almost find as many Chinese restaurants around the place as Maccas!). After World War II, there was a lot of European immigration in the 1960s and 1970s, bringing in Mediterranean influences. Restaurants serving modern Australian cuisine dish up food that uses fresh produce which is influenced from Asian and Mediterranean cuisines. It’s fusion food! Heat some peanut oil in a wok (around 1 tablespoon) and add in minced pork and fry the pork for a few minutes until golden, breaking up any lumps. Then add 1 tablespoon of sugar and 1 tablespoon of fish sauce, and stir fry the pork for a few more minutes. Remove pork mince from wok, transfer to a bowl and set aside. Heat some more peanut oil in wok (around 1 tablespoon) and fry the finely diced shallot until softened and then add in crushed garlic, and fry till fragrant. Add in tomatoes and cook for 5 minutes. Then return the pork back into the wok, add in 2 tablespoons tomato paste and 2 tablespoons fish sauce and fry for one minute until combine. Add in chicken stock, stir everything together and simmer for around 10-15 minutes, stirring occasionally. Taste and season with some salt and pepper. Cook rice vermicelli according to the packet instructions and place onto a plate. Spoon some of the tomato pork mince mixture (aka Bolognese sauce) on top of the rice vermicelli. Crack over some freshly ground pepper. Spaghetti is always garnished with fresh herbs like basil or parsley. So I used some fresh Vietnamese herbs – chopped mint and coriander. I was pretty happy with the result. It tasted great! Soft rice vermicelli topped with a tasty tomato pork mince mixture. The addition of Nuoc Cham provided some spicy and sour tones to the dish. Vietnamese food is all about a balance of sweet, sour and spicy contrasts. The mint and coriander provided every mouthful with a lovely hit of fresh herb flavours which was refreshing against the whole dish. Is it fusion food? East meets West? Vietnamese versus Italian? The idea and presentation is inspired from Italian cuisine. The ingredients used were predominately common to Vietnamese cooking like fish sauce, coriander and mint. I used pork instead of beef mince because pork is used more than beef in Vietnamese cooking. Some popular Vietnamese dishes contain pork like Banh Mi and Bun Thit Nuong. Tomatoes and tomato paste are often used in making Italian pasta sauces but these ingredients are also used in cooking a variety of Vietnamese dishes. Techniques were a mix of Asian cooking – stir frying in a wok and Italian techniques of simmering a sauce. I don’t really have anything against fusion food but I think it is important that is done well. I like art and one of the reasons I enjoy cooking so much is because it allows me to be creative, experiment and development interesting tastes and dishes. I used to paint and now I don’t, I used to create music and now I don’t anymore. Cooking is now my art. There is good and bad art, and there is good and bad fusion food. People should not be turned off by fusion food, only bad fusion food – this should be the attitude to food in general. It looks like spaghetti, until the Nuoc Cham arrives! I was making it Vietnamese, I had to add the Nuoc Cham! Looks like vomit. Fusion food for the most part is gimmicky garbage at best....and a ripoff too! Who doesn't feel hungry after a measley pathetic serving of "exotic" food? !